They say abs are made in the kitchen, and while I’ve never had a six pack, we know exercise alone doesn’t make a fit body. The same is true of healthy, glowing skin. I can prescribe someone an amazing skincare routine, however, if they are putting rubbish in their mouths all day the results will be less impressive. Your skin is a direct reflection of your eating habits. 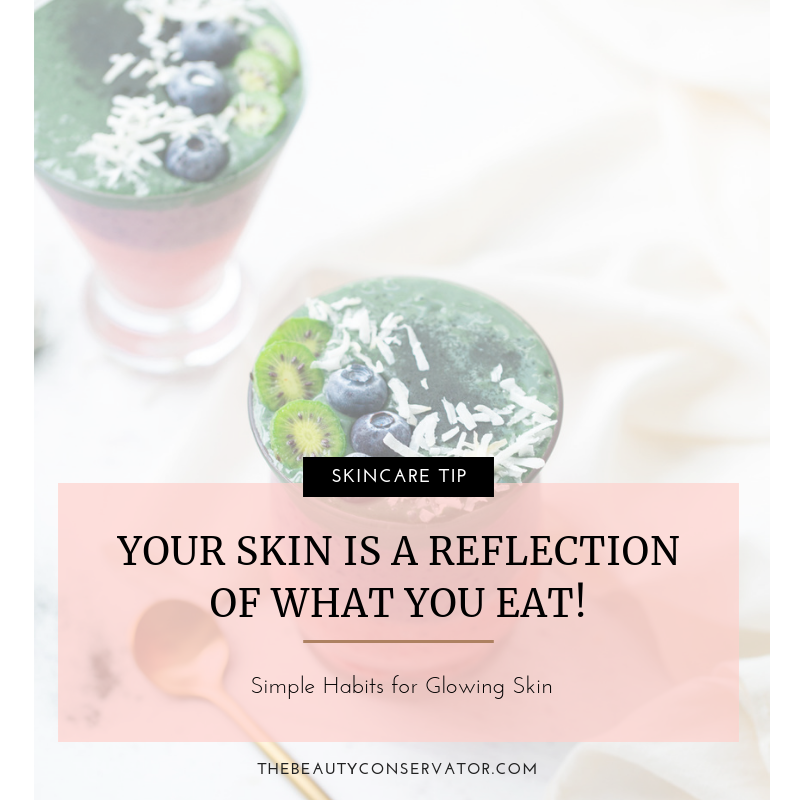 Your at home skincare routine plays a huge role in the health of your skin and your eating habits go hand in hand in enhancing your skin’s radiance. I know diet is an awful word and I’m not talking about idiotic fad diets. It’s more like a lifestyle of conscious choices. While there’s nothing wrong with an occasional detox weekend, it’s got to be more lifelong than that. What good is it if you pop some anti aging supplements and have a daily green smoothie if you’re also combining it with processed garbage. Do you think you would have chiseled, sculpted arms by doing pushups every once in a while? It’s the same with your skin. You can have laser procedures or any number of treatments, but if you aren’t following any resemblance of a healthy lifestyle you can’t expect optimal results. You might get away with this when you’re young but it will catch up. I’m not here to be the bearer of bad news. I actually enjoy heavy cream in my rationed one cup of coffee in the morning, just no sugar. I’ve made some trade offs but I enjoy real food. If you have read Mireille Guiliano’s French Women Don’t Get Fat, I definitely align myself with her philosophy towards food. I highly recommend reading it! Basically eat high quality and in moderation. For example, have a couple pieces of good quality dark chocolate instead of a crappy Hershey bar. I do eat delicious slabs of butter on high quality sourdough bread, just not everyday. Avocado toast was popular in my house years before it became the trendy over-priced bistro offering it is today. But the older I get the more I need to watch my carb intake. We’ve all heard how bad sugar is so I wont go into details other than to say it truly is one of the worst things you can put in your body. It was also one of the hardest things to give up. If a sweet tooth is your downfall start replacing it with better choices. Multiple studies have proven that sugar causes glycation. This means sugar binds with proteins and lipids and causes inflammation. Then your collagen and elastin fibers become compromised, and you know we need those to keep the “bounce” in our skin. The result is less elasticity, sagging, and more wrinkles among other detrimental side effects. If I had an Achilles Heel it would be red wine. Cabernet and friends just seem to pair so well together! 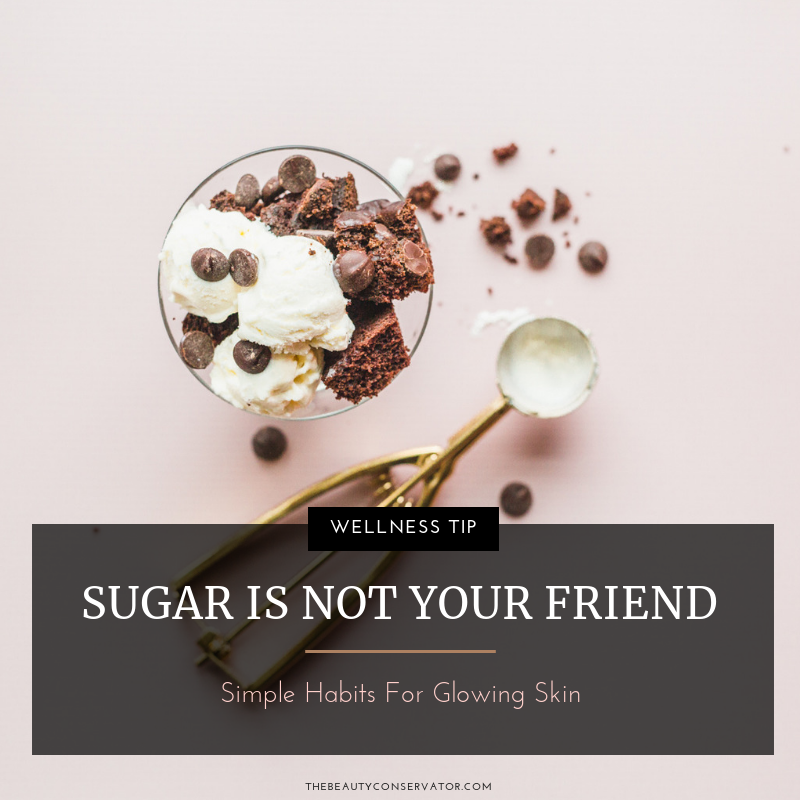 What doesn’t pair well is the crinkly dehydrated skin and under eye wrinkles that show up the next morning mentioned here. My point isn’t to be a killjoy and tell you to give up all of life’s pleasures, rather “All Things in Moderation.” As much as I like to praise the benefits of resveratrol I know I have to pace myself. We’ve all heard coffee can be dehydrating, which seems really unfair given that it’s made with water! When I was younger I drank coffee all day long….raising five kids will do that to you. I no longer need to make sure I’m one step ahead of kids burning the house down, so I have one cup in the morning and no more. I’d like to switch over to tea but realistically it will probably never happen. After all we do need to live a little. The best way to make these changes is to start slowly. Begin with healthy substitutes. If soda is your weakness try kombucha or mineral water with a splash of juice. GT’s Kombucha is my favorite, I drink one about every day. 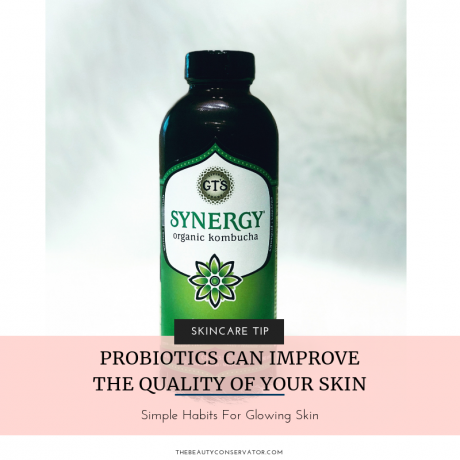 It’s a great way to get more probiotics for gut health. For more on how this affects your skin read The Beauty of Dirty Skin: The Surprising Science of Looking and Feeling Radiant From The Inside Out by Dr. Whitney Bowe. Drinking 4 or 5 cups of coffee a day? Start weaning yourself off that caffeine dependency by just cutting down, that way you don’t get the cold turkey migraine. Have a sweet tooth? Substitute real maple syrup for refined sugar. You can find tons of healthy sugar free recipes on Pinterest. Emmy’s Organics makes some of the best snacks, that are made with agave syrup, if cooking isn’t your jam. If you try to overhaul your diet all at once you may suffer the dreaded detox flu symptoms, slow and steady wins the race. If you’ve been frustrated with the quality of your skin, and you know you are on the best anti aging skincare products, maybe it’s time to look at the quality of your food intake. What is the Achilles Heel in your diet? Are your eating habits showing up on your skin? I’ve cut back on sugar at work and things like banana bread or a bagel first thing in the morning since I feel that “crash” a few hours later. I drink (unsweetened) iced tea instead of coffee. Maybe one soda a week so I don’t beat myself up over the tea (caffeine). My goal is after vacation this week to get back to having healthier choices around the house to snack on. Traci, those all sound like fantastic and doable goals. I was having the same “crash” and had to significantly cut back on carbs. Very wise to have a plan after vacation. Thank you!